For security reasons, some wireless networks don’t broadcast their SSIDs. A wireless network not broadcasting its SSID doesn’t show up in your laptop’s list of networks. Choose Connect To from the Start menu. The Connect to a Network window appears. 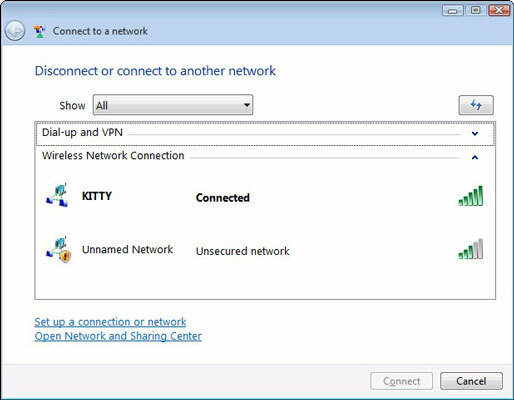 Choose the Set Up a Connection or Network link at the bottom of the window. The Select a Connection Option window appears. 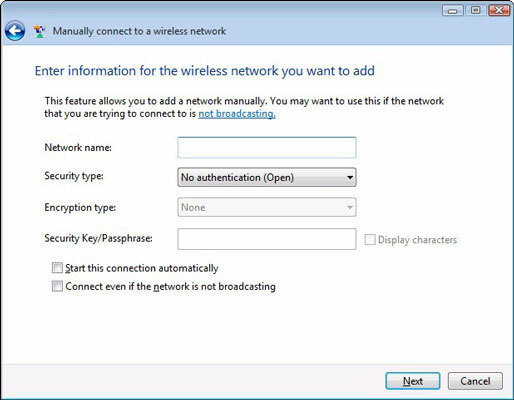 Choose the item Manually Connect to a Wireless Network. The next window that’s displayed allows you to set up a manual connection. Type the SSID in the Network name box. You need to check with the network administrator to see what other tidbits of information are required in order to complete the connection: security and encryption types and a password. The best advice: Put a check mark in the box labeled Start This Connection Automatically. This saves some time by not having to repeat these steps later. Hopefully, Windows goes out and finds the mystery wireless network. If not, you probably goofed something up; check with the network administrator or the settings on your wireless hub. Otherwise, you’re ready to connect. You can now find an available wireless network to complete the connection.